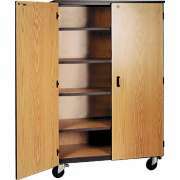 Ironwood Manufacturing brings you library furniture and storage cabinets for a school or office. 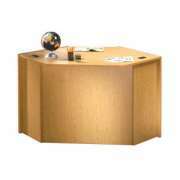 A selection of classic finishes makes these pieces perfect for any professional or educational environment. They are made in the USA and come with a complimentary 25-year warranty. 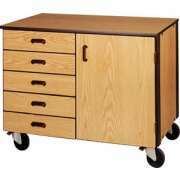 Don&apos;t underestimate the impact that great school and office furniture can have on your space. Tough bookcases and reference desks ensure that your reading room is well-equipped for many hours of study sessions and essay composition. 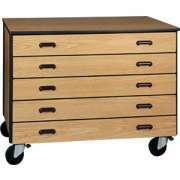 Ironwood furniture will add organization and visual appeal to any room. Drawing students into a school library can be challenging, but this can be a truly valuable space for focused study and research. With the right library furniture, you can help everyone in your learning community appreciate this room. Bookshelves, circulation desks and study carrels are critical components of library furniture that will set the tone in the room. Even a modern library needs lots of space for books. 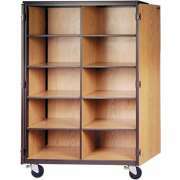 Library shelving is available in a huge selection of configurations so every room can have a custom fit. A modular design which uses starter and adder models is perfect for a space with long rows of bookcases. 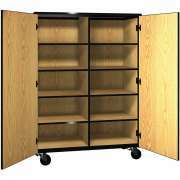 Library bookshelves come in single- and double-faced units so they can be arranged in aisles or placed against a wall. Ironwood Manufacturing&apos;s bookshelves can also be used in a professional space. Many hard-working individuals who have personal offices like to keep some books around for reference or even just to create a nice atmosphere. 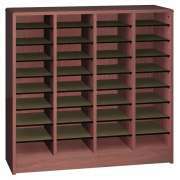 Office bookcases are great to put in a lobby or empty wall space in the executive suite. In addition to housing many books, libraries need to have appropriate places for people to sit and work. Study carrels create a more private space within the shared area which makes it easier for everyone to stay focused. 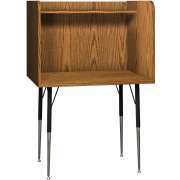 For the modern school library, it is worth considering computer carrels with built-in wire-management. When students bring in laptops, tablets or netbooks, they will be able to plug in their computers without creating tripping hazards or detracting from the harmony of the space. 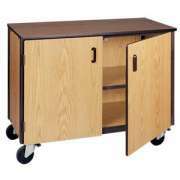 Having a functional reference desk is critical to ensuring that everything runs smoothly. 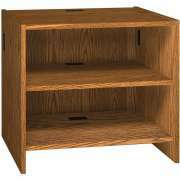 Keeping so many books and periodicals organized can be quite a challenge, so it is important to have library furniture that makes it easy to maintain an efficient system. Ironwood Manufacturing&apos;s information desks are a modular system which enables each institution to choose the exact components that are desired for their particular space. 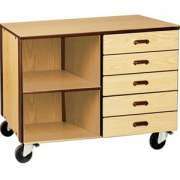 A library circulation desk needs to have a number of elements in order to help librarians work as productively as possible. 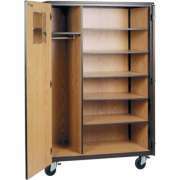 A book return with a book cart makes it easy for patrons to figure out where to put things. 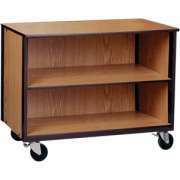 When the book truck is full, it can simply be rolled out, and books can be reshelved directly from the cart. There also should be a space for a computer and a file cabinet to keep forms and papers organized. 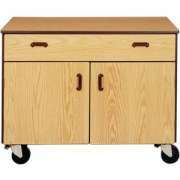 Versatile storage cabinets are essential for every school and office. 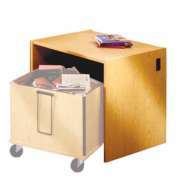 Whether storing office supplies, art materials, electronics or personal items, mobile storage is always great to have. Rather than having to completely empty a cabinet in order to relocate, it can be simply rolled into place with all contents still inside. 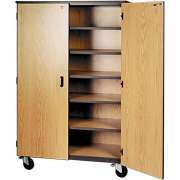 With attractive yet subtle finishes, you don&apos;t have to keep office storage stowed away in a closet, it can even fit in with the office furniture in a workspace. 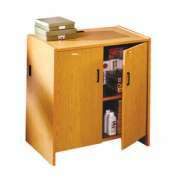 While shelving is often desired in a storage cabinets, sometimes space is needed for outerwear and personal belongings. 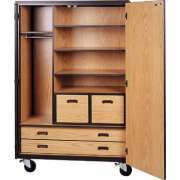 Wardrobe cabinets with hanging space as well as drawers and shelving are ideal for these purposes. Any organization that has many employees needs an easy way to deliver mail and inter-office memos. 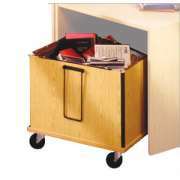 Mail organizers in a teachers&apos; lounge or staff room make it possible for everyone in the school or company to ensure that papers get into the right hands. Literature organizers have plenty of compartments so each person can have their own mailbox. 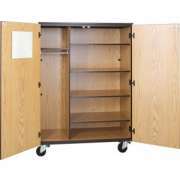 Whether you are looking to furnish a school library, or you just need some extra office storage, Ironwood Manufacturing has great products for your purposes. If you need help determining the right number of bookcases or ideal storage cabinet model, contact the Hertz Design Center for free project-planning advice.